When batch converting images to webp, the extension is always changed to .webp even when this option is checked. Using XnConvert Version 1.79 - windows x64 (Jan 30 2019) - Libformat version 7.25.
which input filename do you use? Happens with any filename. I've been using "Add Folder..." and the "Delete Original" is also checked. 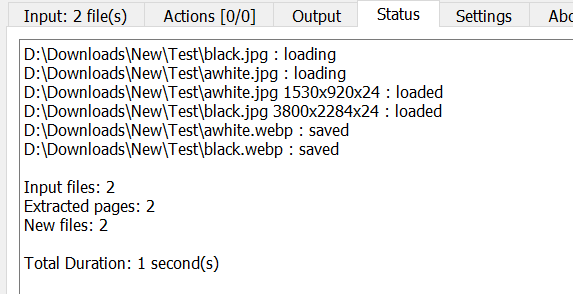 Example: test.png file that I want converted to a webp, but to remain "test.png" will be "test.webp" after conversion. what do you have as output filename? I've tried and it works correctly. Could you post a screenshot of Output tab? sorry i had not understand, why do you want to keep .jpg for .webp? I use webp for making images in visual novels smaller. The exact filename and extension must be unchanged for it to work. Otherwise, have to re-write the scripts with new extensions on sometimes thousands of images. I totally understand if this was not what you intended this function to do, but would be very helpful to many people if it worked as stated. Thanks again for your time, and the great program you've made. Really appreciate it.